The digital UNI 70/C is an accurate and powerful bending machine to bend pipes with large diameters as well as thin and delicate tubes with optimal and constant bending radii and without any pipe deformation. It is suitable to satisfy the bending requirements of the user operating in the plumbing, nautical, hydraulic, industrial, and plant engineering sector. - Digital electronic unit with microprocessor and display for programming and controlling the required bending angle. It is possible to store up to 50 bending programmes with the possibility to store up to 9 sequential bending angles for each programme. - Dimensions: length 810 mm, width 400 mm, height 1100 mm. 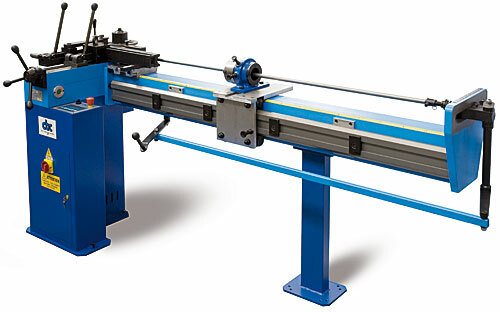 Mechanical spindle for the bending plane regulation. The 2 interchangeable outlet shafts of the standard equipment.